Sew Can Do: 2012's First Craftastic Monday Link Party!!! 2012's First Craftastic Monday Link Party!!! Happy New Year Everyone!! Welcome to a new year full of crafts, creations and most of all fun. My goal this year is to make Sew Can Do about truly enjoying our crafting. Sharing new skills & techniques, ideas to try and things that make the creative adventure easier, more special and the final results a real joy. Now let's get this first Craftastic party of 2012 started by checking out a few of the great links from the very last party of 2011! Creative Passage shared these adorable knit flying pigs. She found the pattern for free too! 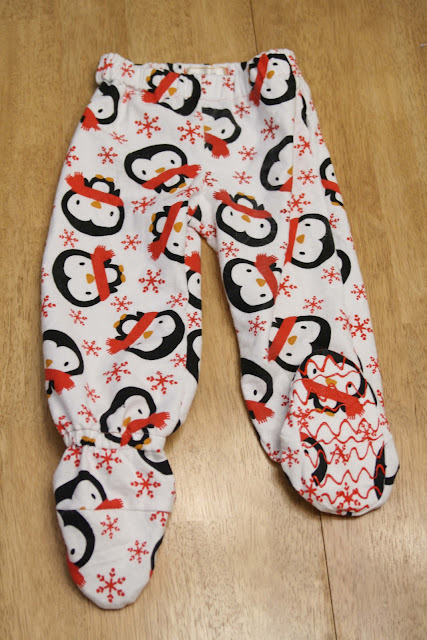 Want to turn any pajama pants into footie pajamas? Melly Sews shared this clever idea for adding perfectly sized feet. Perfect for the winter (and could be used for adults too!!). Sweet Bee Buzzings showed these amazing beaded bells. So impressed with the details!! And Meggipeg shared this adorable fairy doll tutorial. My little lady would love these sweet & easy to make dollies!! Since there wasn't a lot of feedback about doing a 2012 Kids Can Craft link party, I'm not setting that up yet, but the previous party and all its great links are still accessible from the tab at the top of the page. Thanks for featuring my pants - I hadn't thought of the fact that this method could work for adults, too! I really hope I haven't linked these up here before. If I have I am sorry! I am trying to get back in the swing of things. Thanks for hosting! Oh My GOODNESS!!! I still can't believe we are in 2012... :) I am so glad to have found you last year and I look forward to following along again with you this year... :) Have a VERY Happy New Year... And thanks for hosting a great party.. Happy New Year! I added my Sweet & Salty Neighbor Gifts tutorial-great for Xmas, New Years Parties, or whenever! I also linked up my favorite posts of 2011! Wow, I just found your site thanks to the fabulous Ruby Jean!! I hope you don't mind I linked up two of my crafts. I must have been hiding under a rock! LOL I am a new follower! Glad I found you on Pinterest! I'm going to start Linking up here! Thanks for doing this!